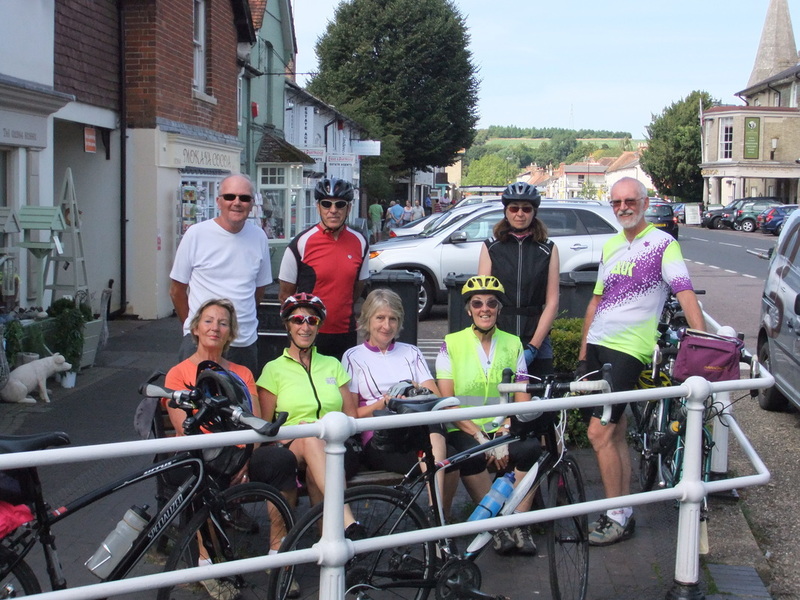 The idea of this short tour was to extend our Lymington-based cycling range beyond one-day outings and to give some of the Tuesday Cyclists (TCs) who had not toured by bicycle before a chance to try it out. Three of these were possible, but as the TCs were to find, while cycling in the New Forest near to Lymington is remarkably easy, it is an inescapable geographic fact that, south of Lymington the Isle of Wight is lumpy and to the south-west are the Purbeck hills, to the west are the Dorset Downs, to the north west are Cranborne Chase and and the West Wiltshire Downs, to the north are the Marlborough Downs, Berkshire Downs and Hampshire Downs in a line and to the east are the South Downs. 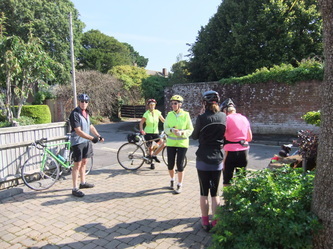 Any circular tour from Lymington, avoiding motorways and trunk roads, is likely to encounter at least two of these - and for the avoidance of doubt in the charmingly perverse way of the English language in this context the word "Down" means a grassy thing that is most definitely UP. 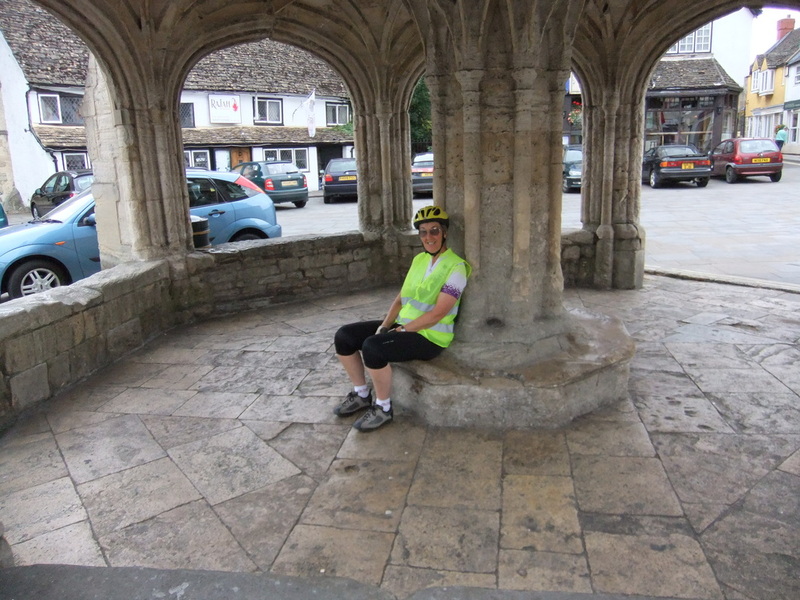 Burley, Damerham, Wilton, Warminster, Bradford-on-Avon, Yatton, Malmesbury, Wootton Bassett, Marlborough, Great Bedwyn, St Mary Bourne, Stockbridge and Bramshaw. 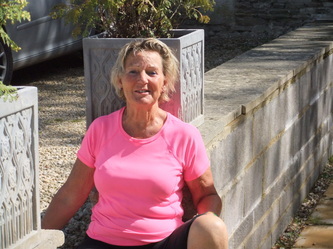 She provided detailed route sheets, tourist notes on interesting historic and geographic places to be encountered en-route and copious instructions; and negotiated an assortment of accommodation and feeding bookings. Sheila issued her packing list as a sample guide as to what might be taken, but this was somewhat immediately undermined by Mike offering vehicle support and a daily bag-drop, thereby instantly removing difficult decisions such as whether to take one or two pairs of socks, or how much one can cut off a tooth brush to make it weigh less while still being fully functional. 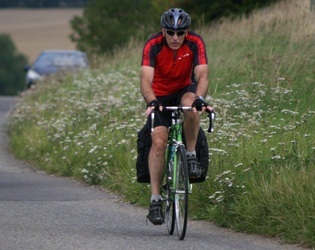 In a true spirit of independent travel David stuck to his intention to carry his own panniers. and Steve, David, Birgit, Sheila and John cycled around the Isle of Wight in possibly the slowest time ever. Much as expected the medical parade revealed that Steve was still limping with her chronic foot problem; David was recovering from a general battering from sailing a boat with broken steering through a Bay of Biscay storm; Birgit was still recovering from a knee operation; John was still awaiting the X-ray results about his bad knee; and Sheila's bad shoulder was not too bad at present. 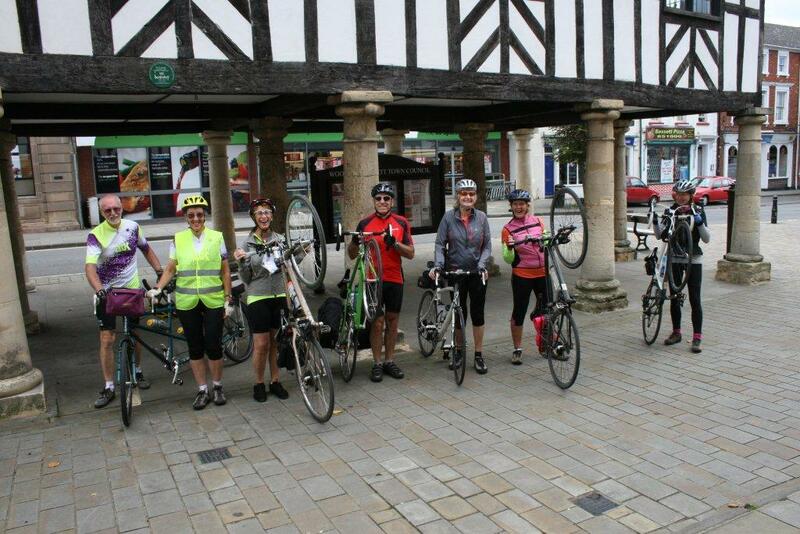 So, apart from buying the Ibuprofen, we were fit and ready to go. Dry with a mixture of mostly sunshine and some patches of cloud. A first shorter day to get the legs going. Across the Forest via Burley towards Ringwood, and up the Avon Valley to Fordingbridge, home to portrait painter Augustus John from 1927 to 1961. Then north west along the little Allen River to Martin, and over Martin Down to Broad Chalke. This is the home of Sir Terry Pratchett and former home of Toyah Wilcox, Sir Anthony Eden and Sir Cecil Beaton. 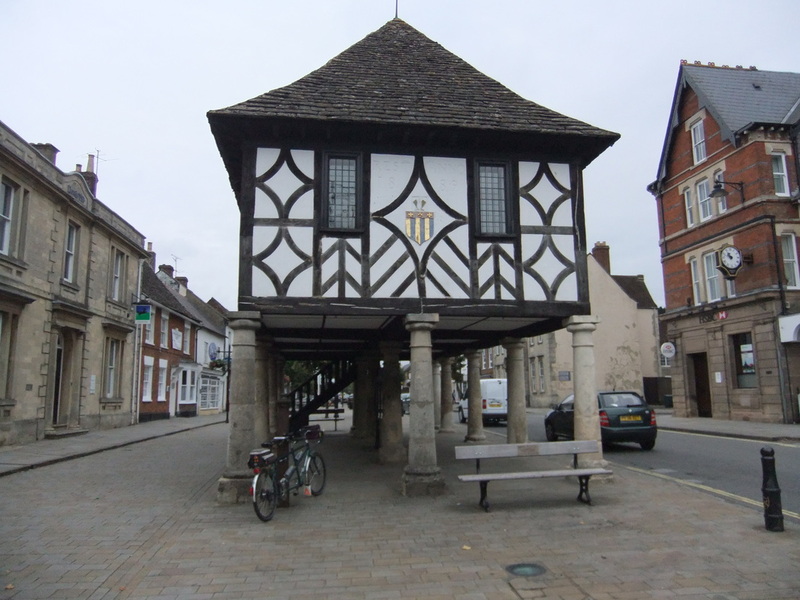 Then descend the Ebble valley briefly towards Stratford Tony and over Warren Down into Wilton, the first county town of Wiltshire until the development of Salisbury with the building of its cathedral. The town was a centre of carpet weaving for over 200 years. Now the headquarters of Land Forces is just north of the town. 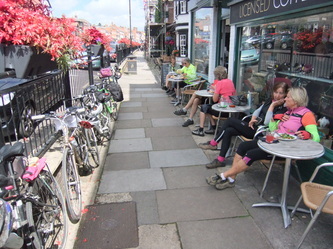 After a couple of group photos (for the 'before' record) we set off along Avenue Road taking the shortest route to Burley with a loop past the White Buck, thereby managing to arrive for our first coffee stop of the tour in even less time than on our regular Tuesday morning outings. 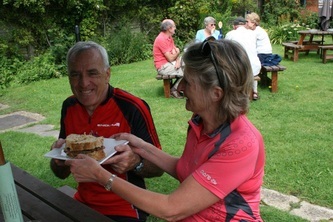 Mike was there waiting for us and we sat in the garden at the Old Farmhouse tea rooms. 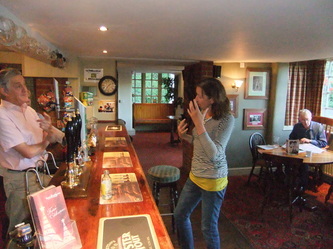 Suitably refreshed we continued, to skirt Ringwood into Poulner and up the Gorley road where we spotted a red car that had been swept off the usually waterless ford on the Lin Brook by the torrential downpour of the previous day. With this reminder we bypassed the Moyles Court ford in case there was still a lot of water running there. Turning left into Mockbeggar Lane we said goodbye to the New Forest and set off into new territory, passing a small camel in a flower bed - becoming quite foreign already. 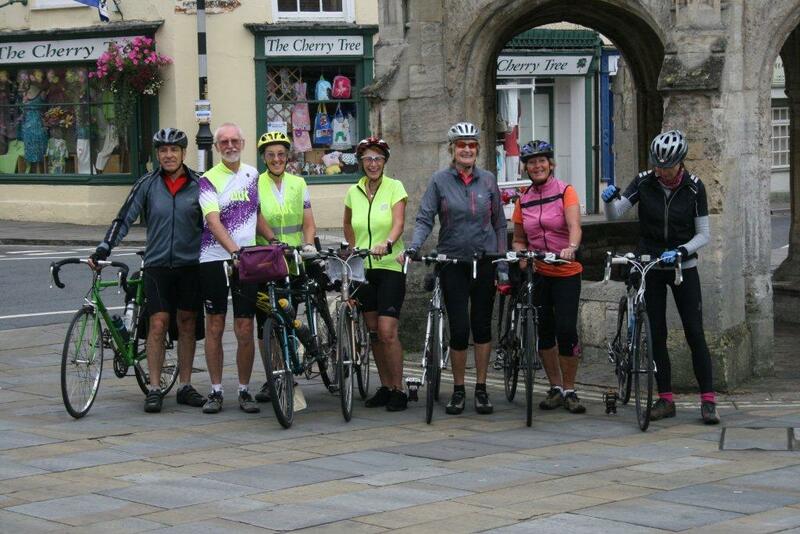 We cruised on to the Avon valley and stopped at Ibsley bridge to view the river. Continuing along the Avon valley we climbed away from the river to the Augustus John pub where we turned left to Damerham, sweeping down Court Hill to lunch in the garden at the Compasses Inn. It was pleasant sitting in the garden in the sunshine. The new landlady wasn’t the best adder-upper, but was very helpful in resolving just what ingredients should be in a Caesar sandwich from the complicated options on their menu. 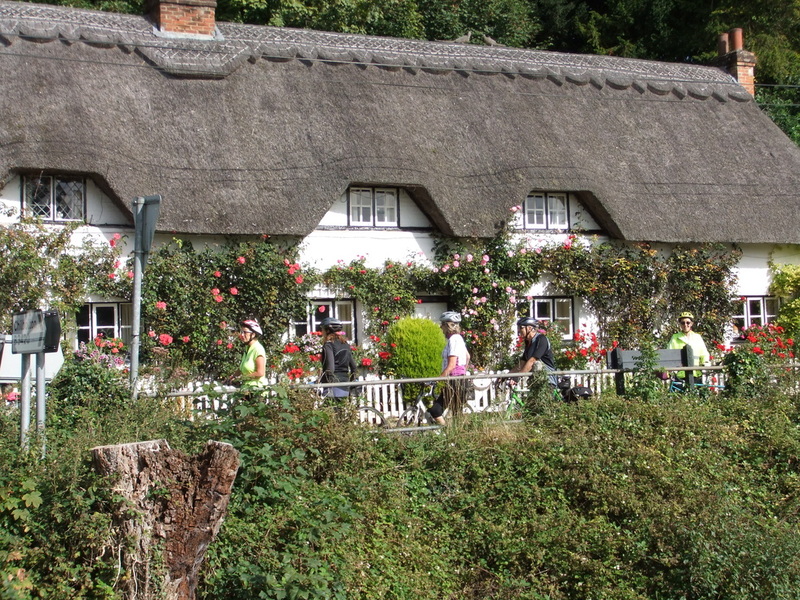 The discerning house hunters in our group appreciated the thatched cottages in Martin (the first of many we would see on the trip). 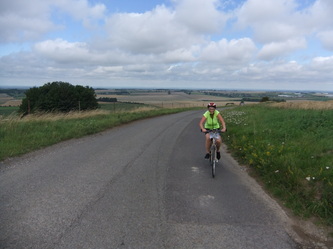 After crossing the A354 dual carriageway we paused to take on water and compose ourselves for the next bit of the tour, then attacked our first major hill as we climbed steadily to the top of Martin Down, with Mike capturing our efforts on his camera. 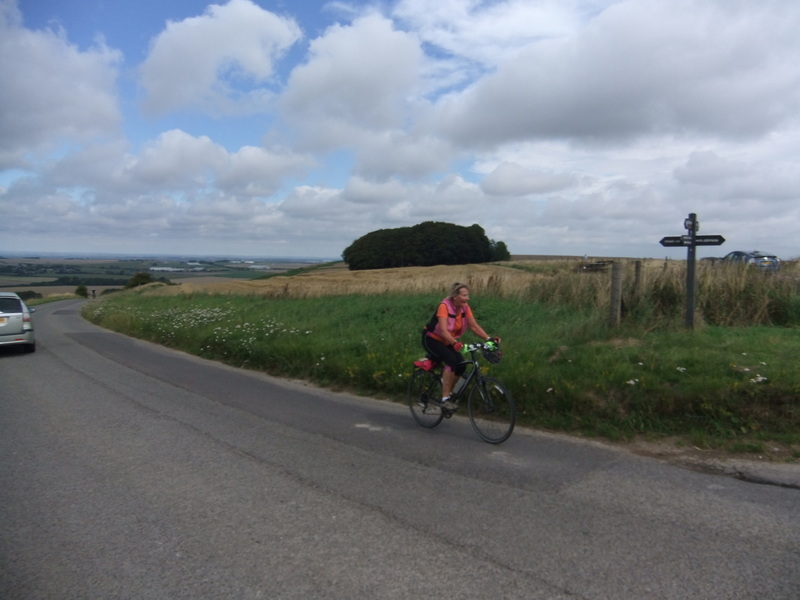 We paused at the top to take in the view back across the Forest and out ahead into Wiltshire before descending at speed to Broad Chalke. After a short ride east along the Ebble river, we turned north to ascend the two shorter climbs over Warren Down noting some British Cycling signs by the road. These proved to be early warning of a 100-mile event on 28th August, preceded by some sportifs on the Saturday. We then enjoyed a fast descent into Wilton pausing briefly as we crossed the River Nadder on the way. 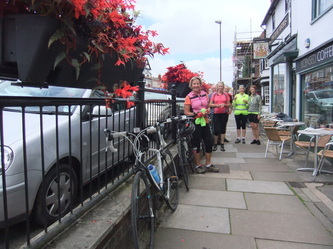 Our accommodation at the Pembroke Arms hotel was found without difficulty, where our bikes were stabled in a seminar room and Mike joined us. We seemed to be the only people staying at the Hotel, which caters mainly for weddings and conferences. Part of the team repaired immediately to the Wilton Garden Centre via Mary’s churchyard shortcut for tea and cake in hot sunshine. Steve and David did an early evening reconnoitre of the recommended Greyhound Inn and were befriended by the little pub terrier which leaped onto the bench and snuggled down between them. The young men in charge at the hotel that evening looked younger than policemen! Six of us set off for dinner at the Greyhound, having been informed that Birgit and Judy were already ensconced outside with their aperitifs. 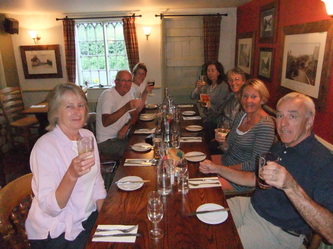 We enjoyed a good pub meal and friendly service before retiring to the Pembroke Arms. After discussing today's run over dinner, talk turned to tomorrow's route. 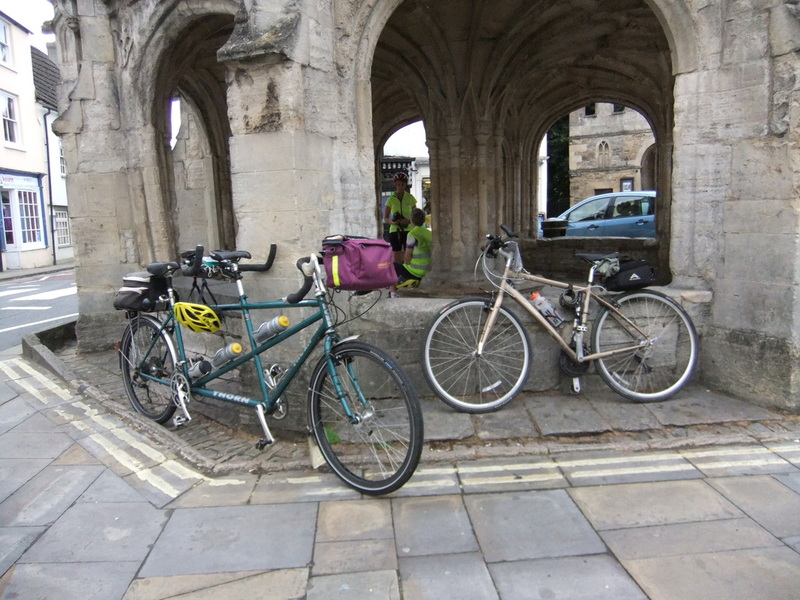 This will be through Bradford on Avon, which Mary knows well, so she caused much agitation (and a potential sleepless night for some) with her warnings about the very steep and busy epic climb out of Bradford on Avon, well known to be almost beyond human endeavour on a bicycle. Along the delightful Wylye Valley to Warminster, and near the Somerset-Wiltshire border pass through villages formerly dependent on the wool trade to Bradford-on-Avon (once a wool weaving town), and the Kennet and Avon Canal. 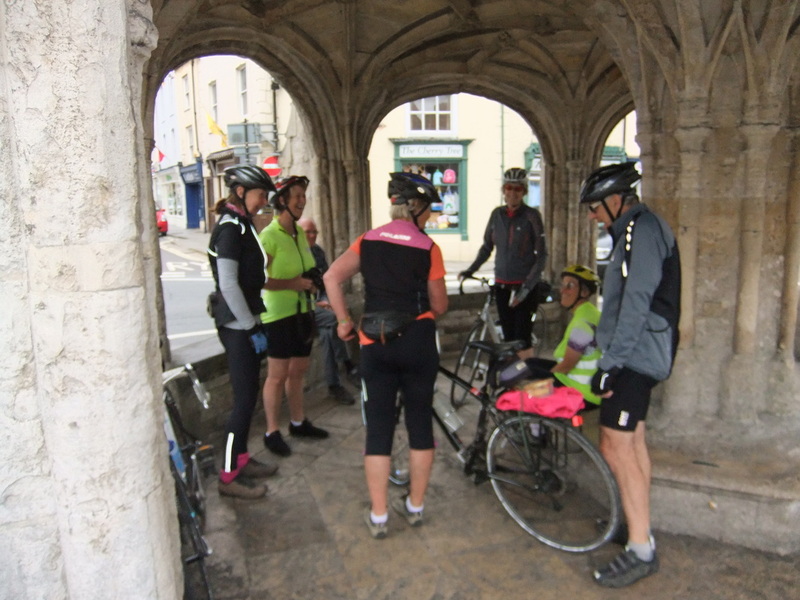 Cross the Avon into a rural area to Corsham, which benefited first from the wool trade and then from the underground quarrying of Bath stone, and was said to have provided the inspiration for Dicken’s ‘Pickwick Papers’. 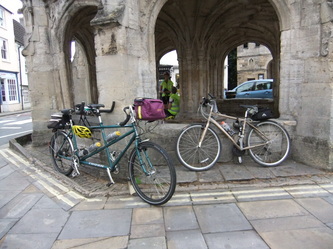 More rural riding to Malmesbury on the confluence of the Bristol and Tetbury Avon streams, and the oldest borough in England. The first Abbey was founded in 675, and in 1010 a monk called Eilmer flew 200 yards with a primitive hang-glider from a tower, breaking both legs. The third Abbey had a spire taller than Salisbury Cathedral, but it fell down. When the abbey lands were sold at the Reformation the town turned to wool and lace-making. Our longest day so it is a 9.00am start. Having made only a small dent in the huge array of continental breakfast served by Ido Davids, the Israeli hotel owner, we left Wilton under cloudy skies but enjoyed the flattish run up the Wylye valley passing many pretty cottages and grander stone houses, some delightful alpacas in a front garden and the ginger piglets of the Ginger Piggery tea rooms. 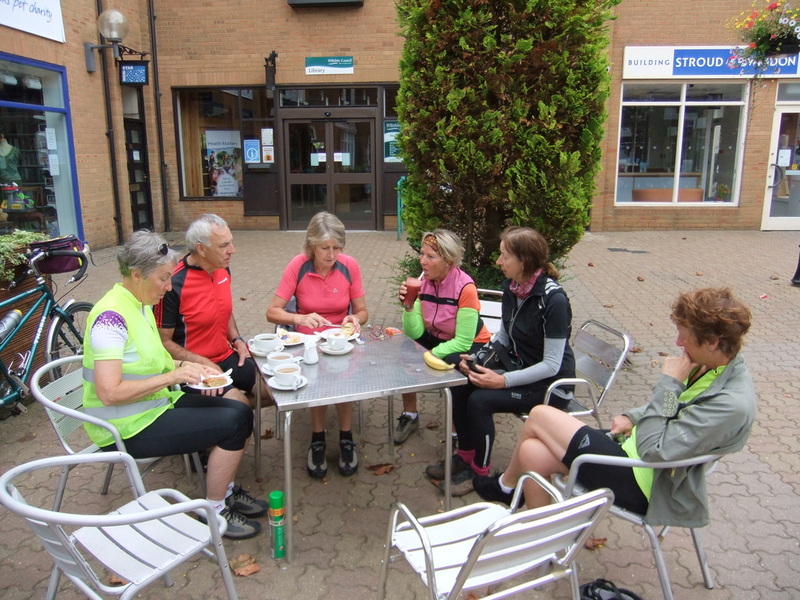 At Warminster we located the popular Cornmarket Cafe and Mike, and sat outside for coffee. After a few drops of rain Steve moved inside. The rest of us being hardy souls stayed outside - for about another 60 seconds - and then admitting that it was raining joined her. Having put off our departure for a while we finally decided to don our rain gear and go, but the rain stopped almost immediately and we took much of it off again. 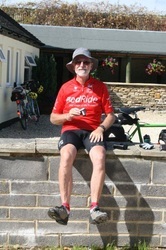 The route briefly went into Somerset through Dilton Marsh on a choppy road; and in Rudge we stopped outside a phone box converted into a village book exchange and produce stall to remove Judy’s pump which was causing problems - David offering to carry it. 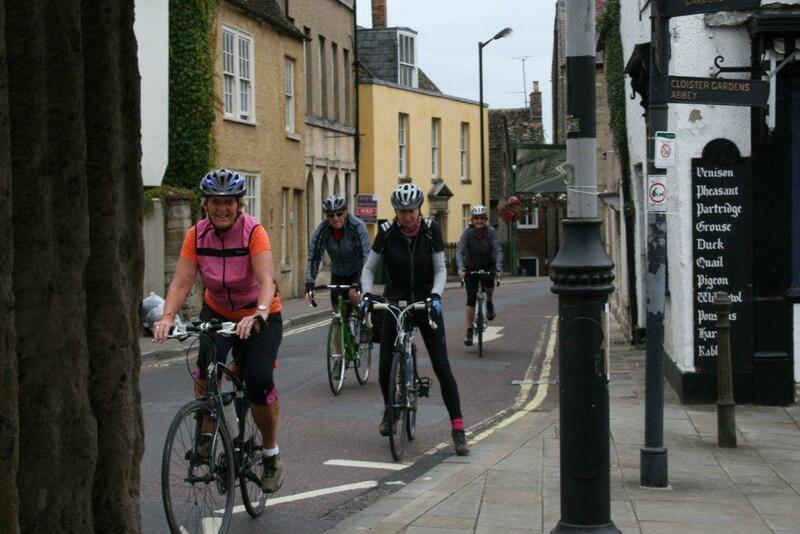 Continuing through Rode we joined a very straight B road down to Bradford on Avon. On arrival John was told off for cruising too fast on a run-away tandem. We found the busy Lock Inn cafe by the busy Kennet and Avon Canal (and later Mike did too!). 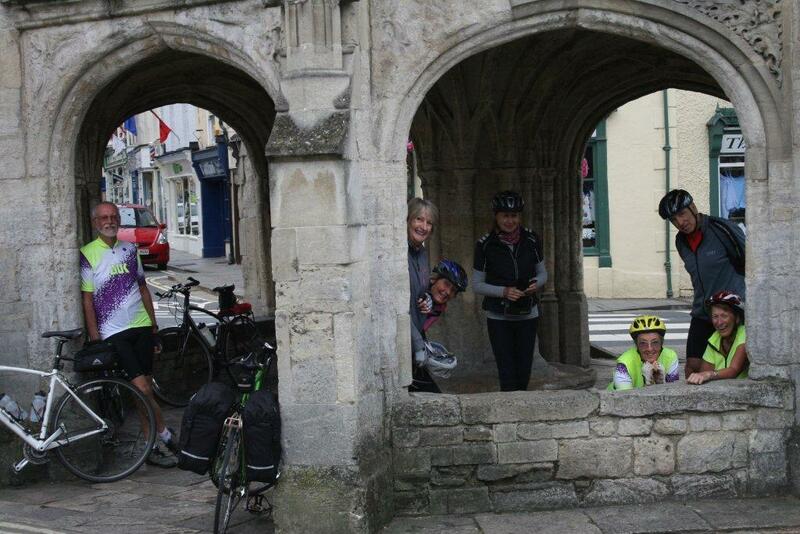 Having just parked the bikes Sheila found a table under cover when the rain came and proved to be quite heavy. 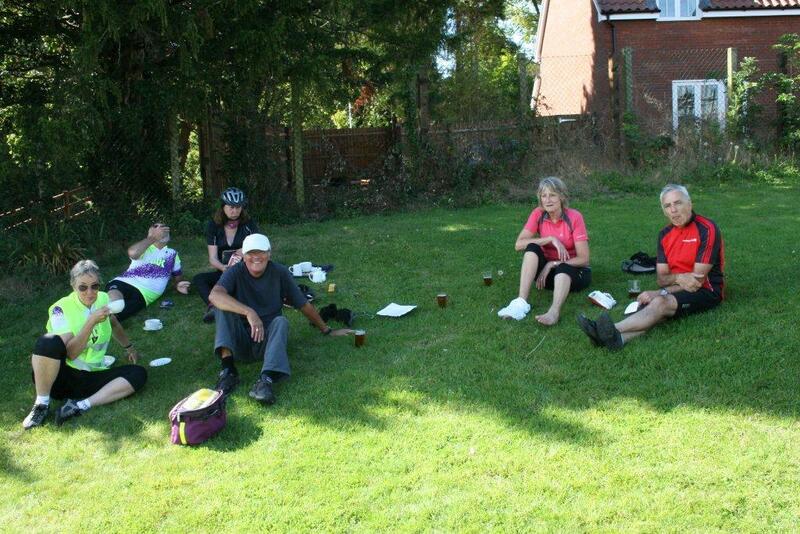 There was plenty of entertainment watching the canal boats, wet canoeists and tow path walkers and cyclists. 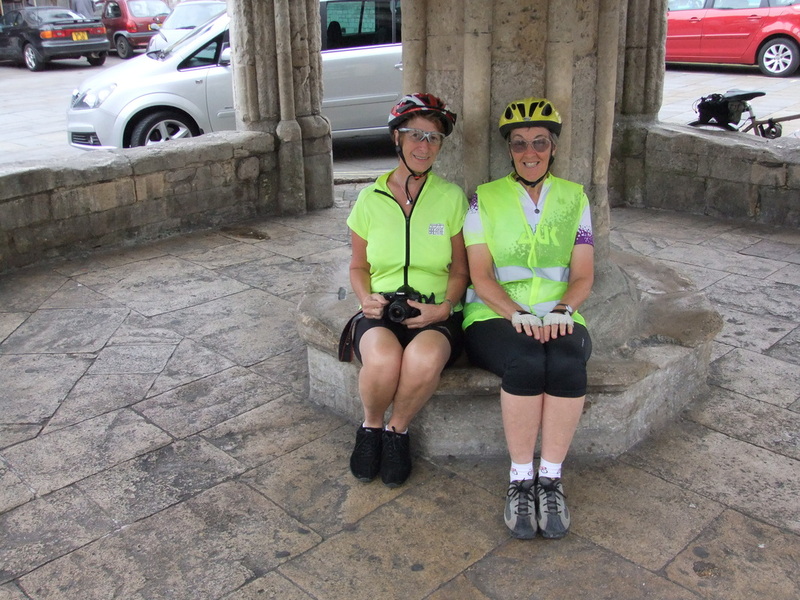 We delayed our departure until the rain seemed to have stopped, then cycled down to the river to admire the view of the town beside the Avon. Running out of excuses for further delay, we set off through the town centre and up the steep, wet hill of Mason’s Lane, which turned out to be 12% (1 in 8). 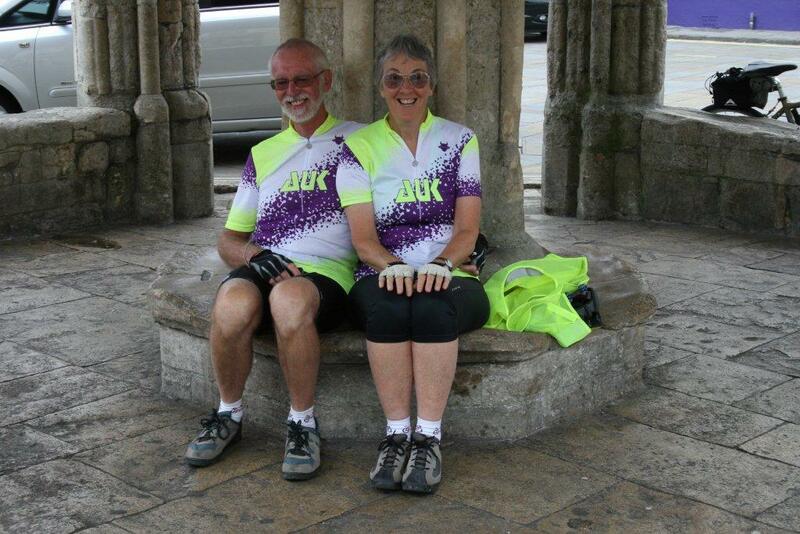 John and Sheila arrived at the top first, not because of superior fitness but because the stalling speed of a tandem is appreciably faster than that of a solo bike. 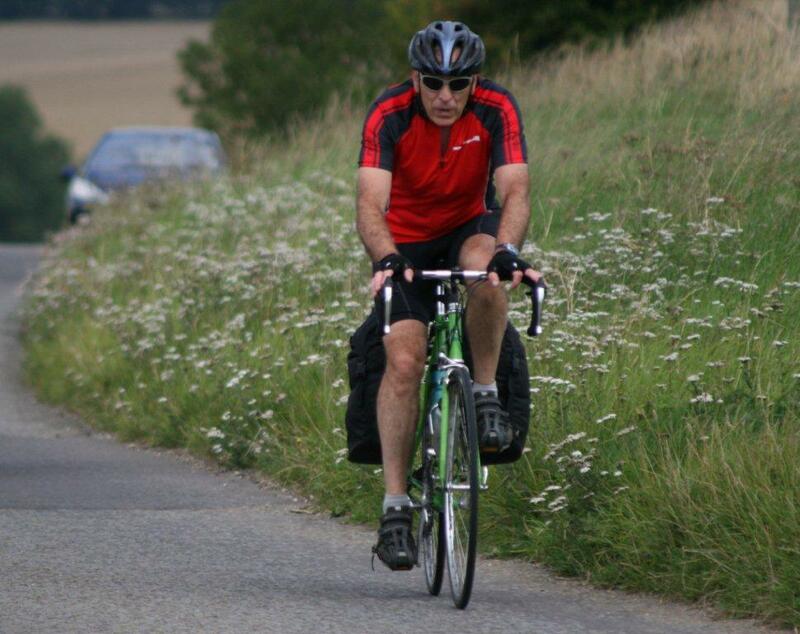 David experienced wheelspin on the wet road and the front of his laden bike lifting up alarmingly but arrived at the top with man and bike still together. 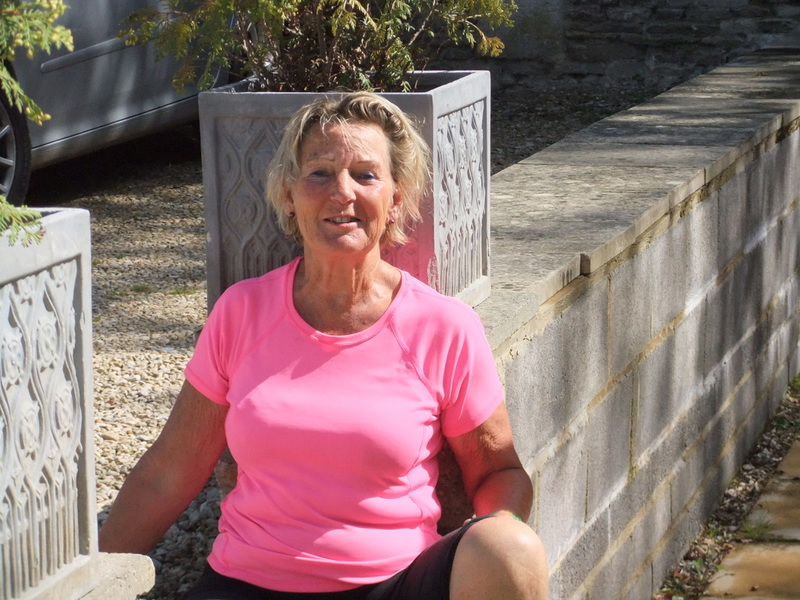 Mary laboured up to prove to her children that if they could do it so could she. Birgit declared that this was "nothing compared to Vietnam". 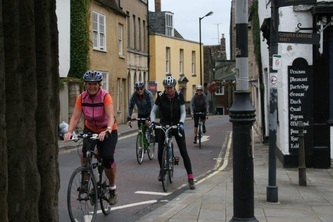 Gathering at the top we then enjoyed a flatter ride across the fields through Atworth to Corsham, and then through the manicured stone village of Biddestone with its immaculate greens, perfectly maintained stone buildings, tidy village duckpond and traffic calming zone. On a steep descent David hit a pothole and nearly collided with a wall, but managed to regain control, and Mary behind managed to bounce through the hole and pull out avoiding him. 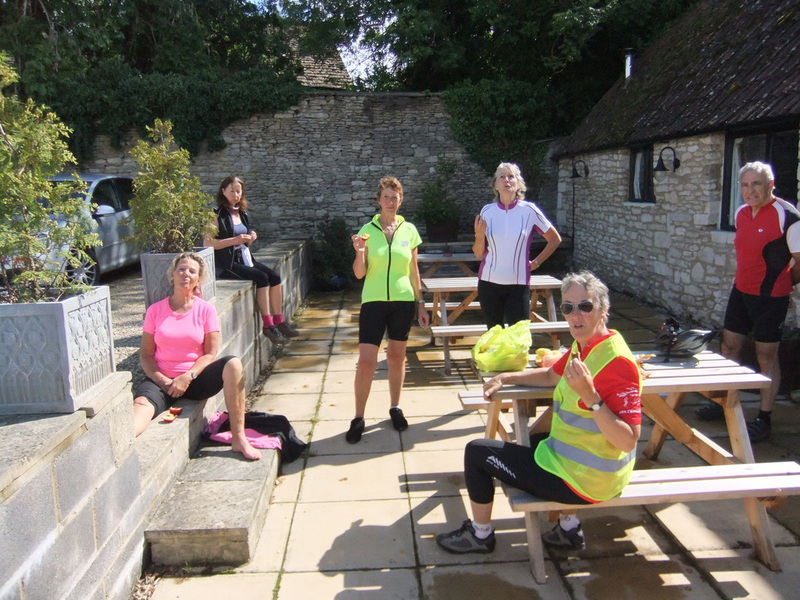 Shaken but whole, they arrived safely at Yatton for tea on the rear patio of the Bell Inn, where Mike provided eats to go with our tea and Brigit did her exercises. The rest of the ride through Grittleton, Norton and Foxley was easy and we then descended steeply toward Malmesbury with a short final climb. Judy, Steve and David set off left to their B&B, and once we had recovered Birgit, who had set off right towards the town centre, she joined them. Their bikes lived in the garden. The modern B&B was comfortable if a little over-provided with cats and bric-a-brac creating an unusual atmosphere. Mary, John and Sheila headed right to their Victorian Gothic B&B, where Mike met them to appreciate the stunning valley views from Mary and Mike’s attic room. The bikes lived in the study of the absent but consenting (according to his wife) husband of hostess Sharon. 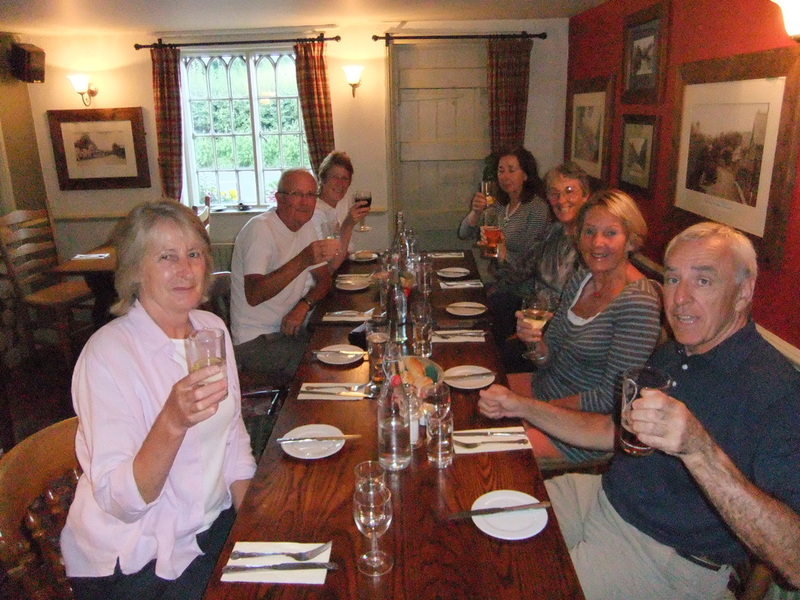 Mike, Mary, John and Sheila made a short walking tour before supper, spotting the sites of the West and South gates of the town, visiting the abbey ruins and garden, and sighting the delightfully named Smoking Dog pub with appropriate inn sign before returning to the Buttercross. Birgit and Judy treated themselves to a drink at the posh Old Bell Inn, and we all found Steve and David sitting comfortably in the atmospheric patio of Amanda’s Bistro. More rural riding to the town shortly to become Royal Wootton Bassett, granted royal patronage in March 2011 by the Queen in recognition of its role in the early 21st century military funeral repatriations which pass through the town. 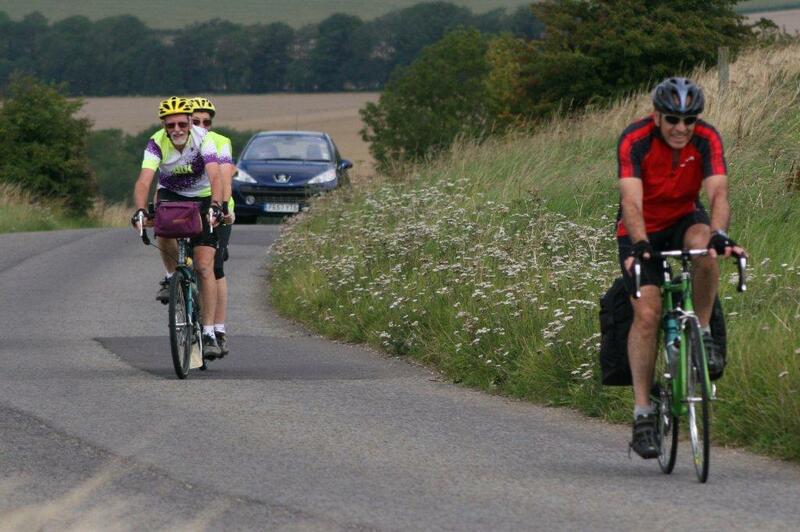 Then over the Marlborough Downs to Marlborough, a market town on the river Kennet known for its College. The name is thought to mean Merlin’s Barrow and legend says he is buried in a mound in the College grounds. Nearby Savernake Forest was a favourite hunting ground of William the Conqueror. Follow the Kennet to Ramsbury, then head south across the fields to Great Bedwyn and the Kennet and Avon Canal again. 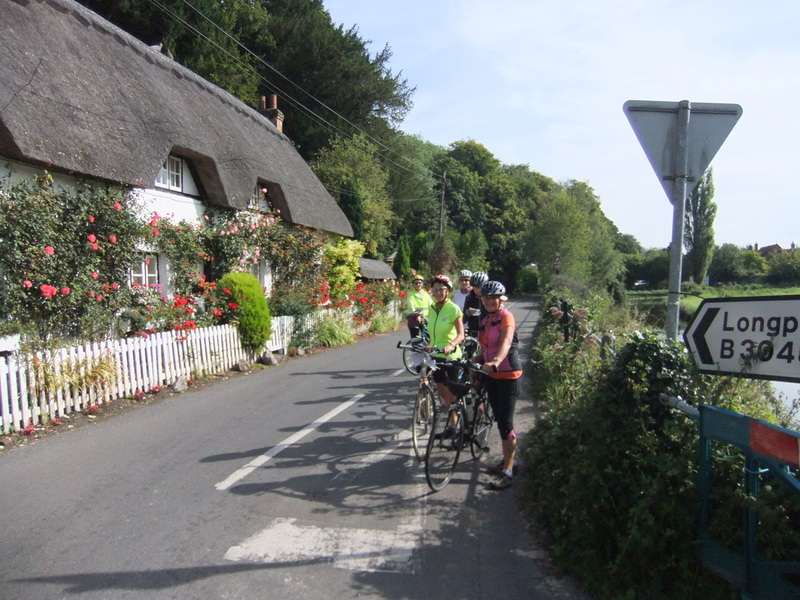 More rural riding through Vernham Dean to Upton, then descend the valley of the little river Swift through Hurstbourne Tarrant, a favourite of author William Cobbett, to St Mary Bourne with its thatched cottages and water cress business. The Kinfield B&B party was a little delayed at our assignation at the Buttercross as Judy had woken to find a puncture. This was swiftly repaired by Birgit with the help of the track pump which arrived with Mike as he came to pick up the bags. 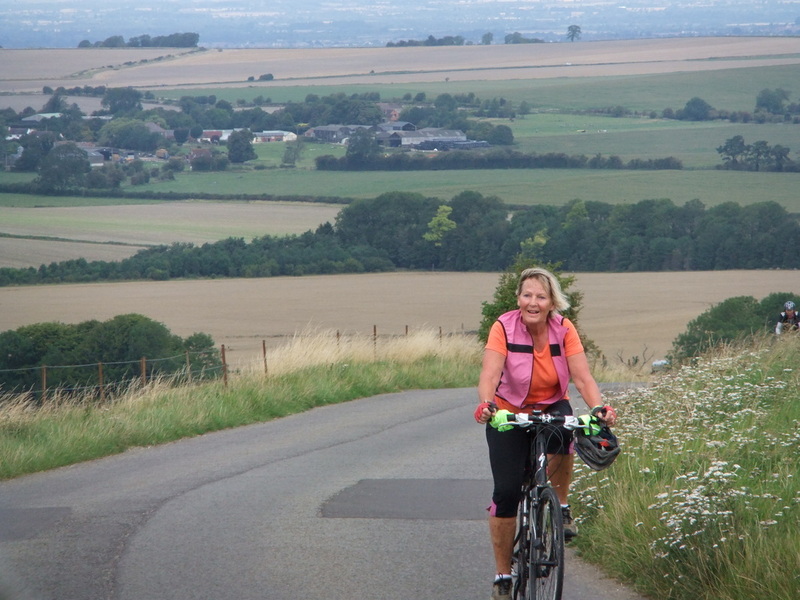 After a photo shoot at the photogenic Buttercross, we set out (after a nearly taken wrong turning due to identifying and sorting out a rattle on Birgit’s rack) along a lovely ridge with surprising long views to the south. Undulating terrain brought us to the foot of the hill leading steeply up into Wootton Bassett, where Sheila checked her route before confirming that we did need to climb up into the main street. 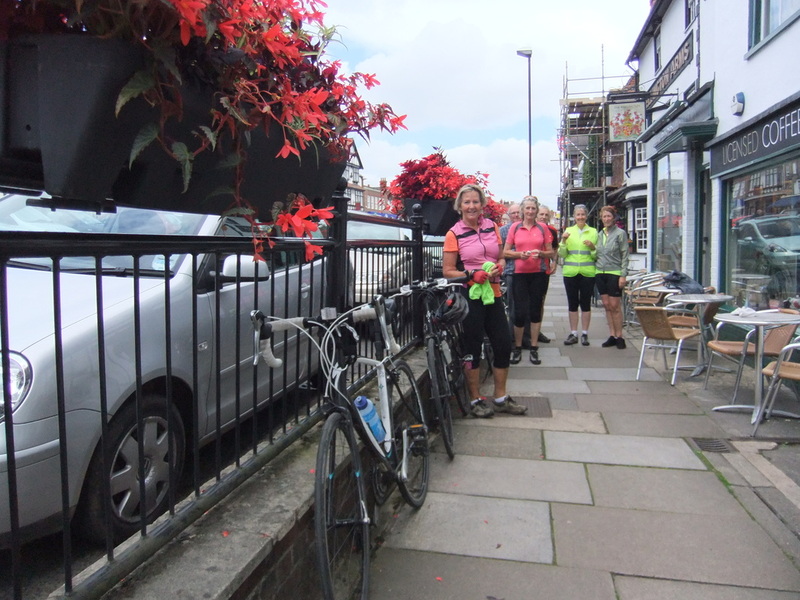 Here flower baskets on the lampposts led to the well-restored raised town hall and new war memorial, where we turned into the Borough Fields shopping centre to find Mike and the Cafe Italienne. 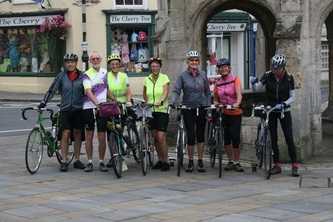 After sitting outside for coffee we had a brief group photo back at the town hall, before descending to rejoin the route and head southwards. 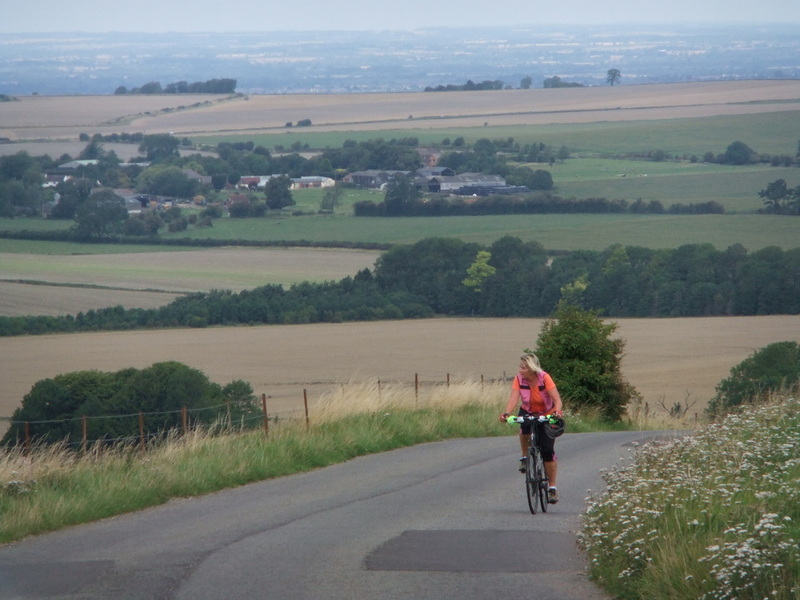 Knowing that we had the Marlborough Downs to climb, we were partly prepared to find that the village of Broad Hinton stood at the foot of an extremely sharp 14% climb up the escarpment. Congratulating ourselves on reaching the top some of the party were soon to discover that this was not, as they had thought, the Marlborough Downs we had just climbed, but merely a prelude to the hill to come, which was revealed as the road then levelled out giving views of a white horse to the left and of the Marlborough Downs in front. 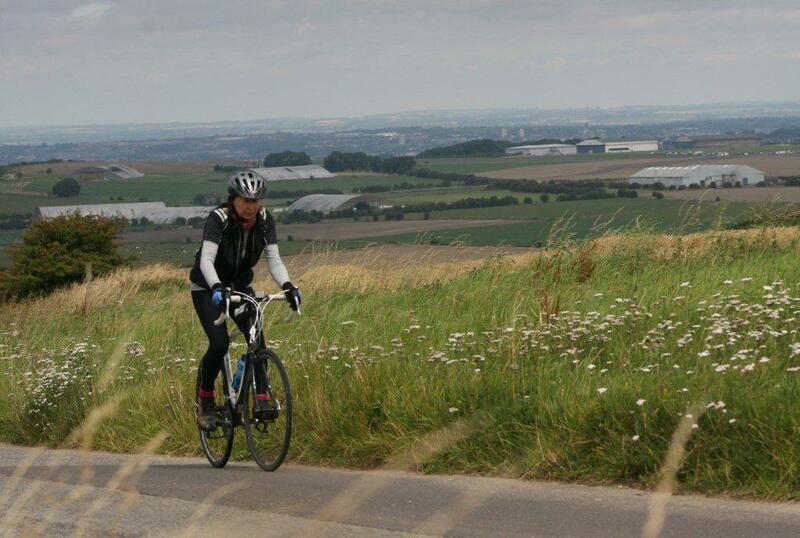 A steady approach brought us to the foot of Hackpen Hill and a second white horse. 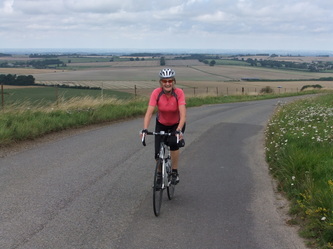 Mike waited at the top by the Ridgeway with his camera to capture the pain as we all arrived pedalling furiously in the lowest gears we had up the 12% climb, and took in the excellent long views to the north. The long descent was breathtaking. 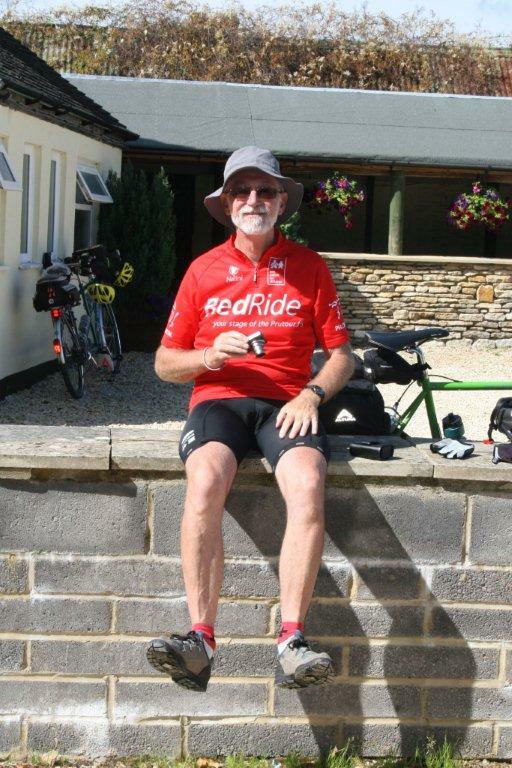 John braked to get into conversation with a Vegetarian Cycling Club rider on fixed who was pedalling for his life and we all disapproved of four boy-racers in souped-up cars who tore past us dangerously. After grouping up at a T junction we came down the final hill into Marlborough past Giffords Circus camped on the green with their caravans and vehicles, some classic, in brown and cream livery. Mike had checked the cycle parking possibilities at various cafes and reported that the best cafe, the Food Gallery, has good railing parking. 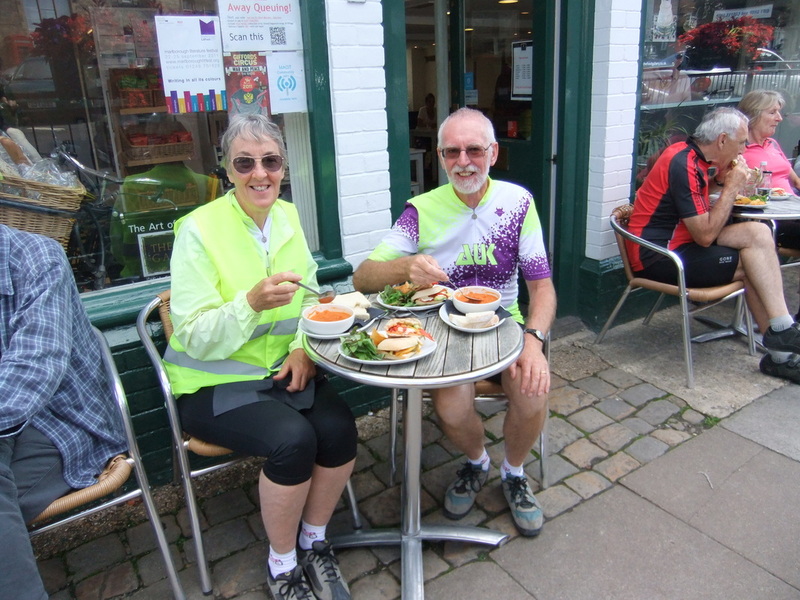 An excellent and leisurely lunch break followed, so that Birgit, Mary and Mike could appreciate Marlborough High Street in the sun. 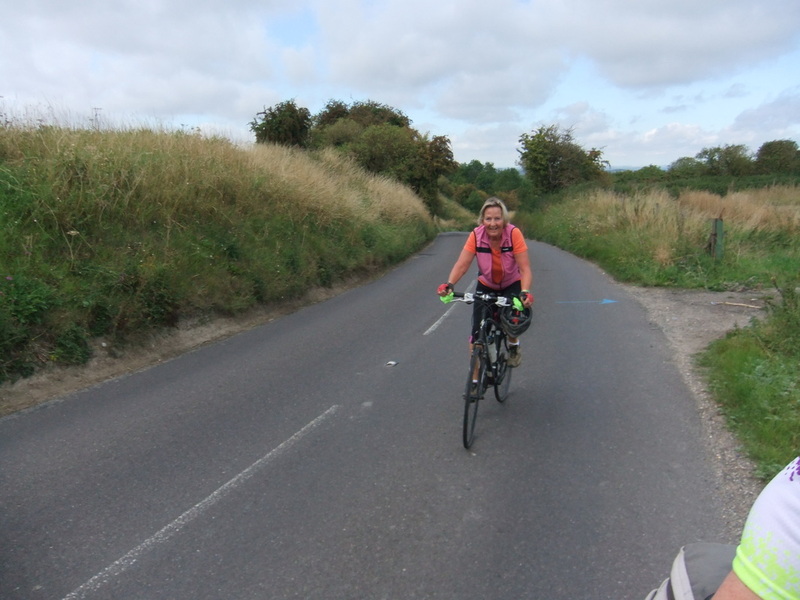 Retracing our route to the end of the High Street we took a pleasantly undulating road along the Kennet valley to the village of Ramsbury, where we turned south to cross the river. The 17% road sign came as a shock to everyone, and John announced a group walk as we approached the escarpment. 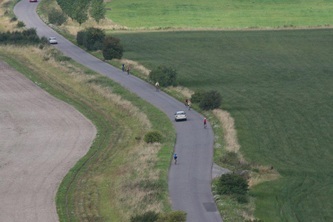 Braver members of the team attempted the climb but gave up as the road turned steeply. 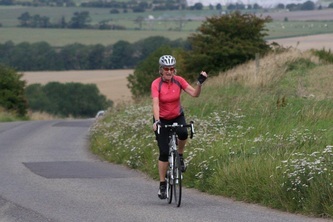 Steve adopted the most innovative approach, walking backwards to rest her toe while Sheila pushed the bike, and all arrived slowly but safely at the top in due course. 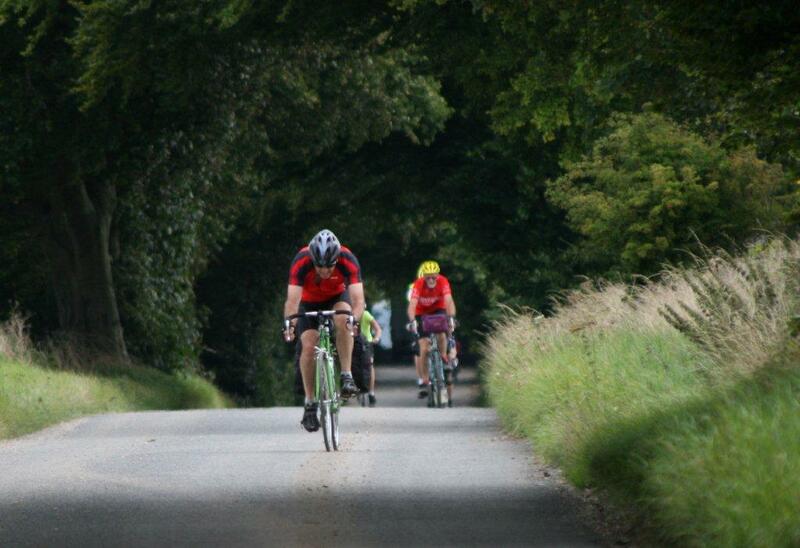 The route onwards to Great Bedwyn was not so challenging. Earlier in the day the general view was that we did not need a tea stop today, but now after 14%, 12% and 17% hills and in serious need of a break we reached the Three Tuns pub to meet Mike and flopped gratefully on the grass in the shade with tea and cold drinks. 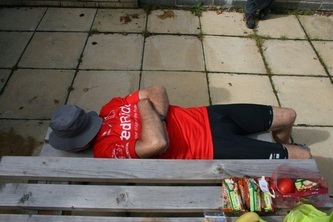 An ice pack relieved first Steve’s painful toe and then Birgit’s aching knee. Crossing the Kennet and Avon Canal again, with the narrow boats bathed in warm sunshine, Sheila nearly allowed the team in front to take the wrong turn up a hill but the GPS came to the rescue and wild hooting of the tandem horn retrieved the rest. However Mike had gone ahead and we had to phone to retrieve him! 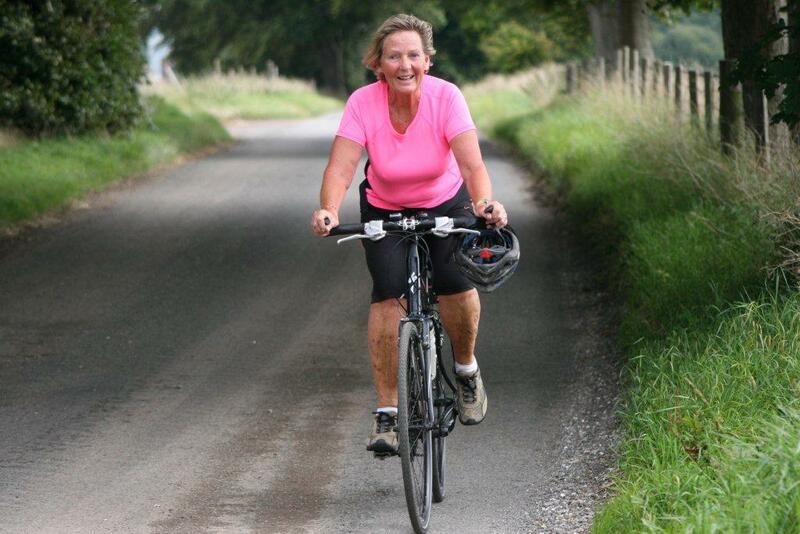 The road was still undulating and one steepish hill lay ahead, but the team sailed up it without trouble, although on the descent Judy was stung on the forehead by an unidentified assailant. 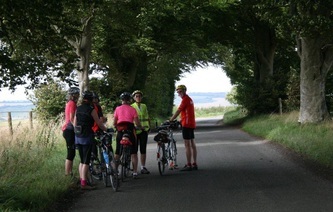 The forward party was instructed to pedal on, while the tandem and Mary hung back to await her arrival. Back in Hampshire once more we reached the flatter haven of Vernham Dean to check her over, and she soldiered on. Discussing her misfortune on the tandem, John suddenly exclaimed and found he too had been attacked under the top of one sock. 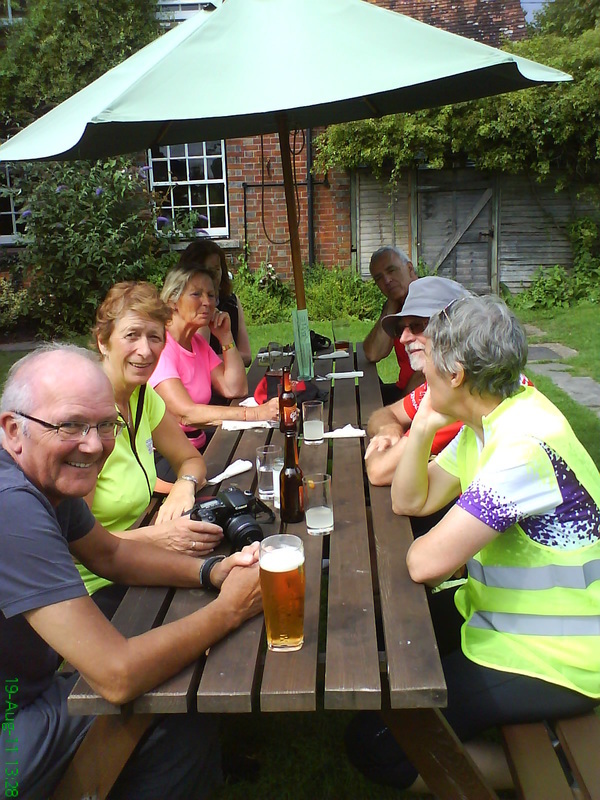 Mary, Judy, John and Sheila then pedalled steadily to follow the others down the valleys of the Swift (little more than a ditch) and the Bourne through Hurstbourne Tarrant to St Mary Bourne, where they found (and rounded up) Birgit outside the Coronation Arms, and Steve and David safely at the Bourne Valley Inn. The bikes were first tucked into the bin store where there was rather a lot of broken glass, but this was renegotiated when the landlord arrived and they moved into the main dining room / function room onto nice soft carpet. Steve lent her sting relief stick to Judy for her forehead and to John for his ankle. The accommodation was very satisfactory and good value, and the landlord and landlady, Peter and Jane, were very welcoming. Dinner cooked by an assistant 18 year old chef flying solo for the first time was at a long table and was warmly received by the team, who gave him two rounds of applause afterwards. More rural riding town the Test Valley, bypassing Whitchurch with its silk mill, to Wherwell, where Elfreda founded an Abbey on the water-meadows in 986, possibly as a penance for murdering her eldest stepson so that her own son would become king. Pass two estates owned by the John Lewis Partnership at Leckford Estate and Longstock Park, the latter the home of the original John Lewis for some years. Along the banks of the Test at Longstock stand circular thatched huts used by anglers. Stockbridge grew in importance when Welsh drovers rested there with their flocks on their way to various sheep fairs and markets in the South East. A thatched cottage known as 'Drovers House' has the message in Welsh painted on the wall: 'Seasoned hay, tasty pastures, good beer, comfortable beds'. Edward VII regularly visited his mistress Lilly Langtry here. 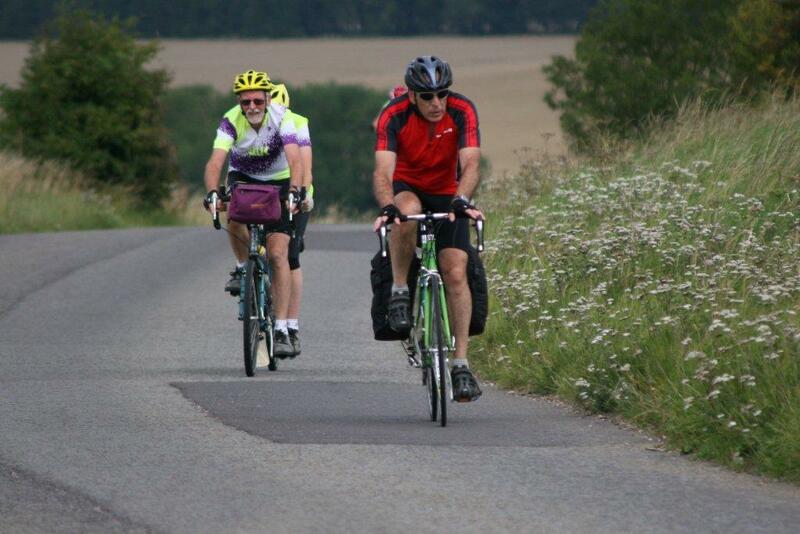 Continue to descend the Test Valley to Mottisfont, where an Augustinian priory was founded in 1201. Leave the Test to pass through woods and farmland to the northern edge of the New Forest and to Bramshaw.and the Bramble Hill Hotel, a former Royal hunting lodge. 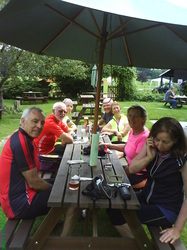 Climb to Fritham and Stoney Cross, Boldrewood and then down the Ornamental Drive to Brockenhurst and home. A sunny start to the day had the team off to a flying start after a good breakfast, and we actually left 20 minutes early, sailing on down the Bourne and Test valleys until Mary got stung, and Steve came to the rescue again with her sting relief stick. We paused before Wherwell to admire a lying-down concrete camel artistically overgrown with ivy in a garden, and then spotted reindeer in the garden opposite. 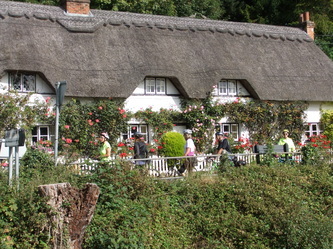 At the junction before Wherwell two thatched cottages with roses along their fences demanded a photograph, before we continued through the village and down to Fullerton and a pleasant ride over the water meadows to the John Lewis estate at Leckford, and up the hill to turn left and through the pretty village of Longstock on the bank of the Test to Stockbridge. 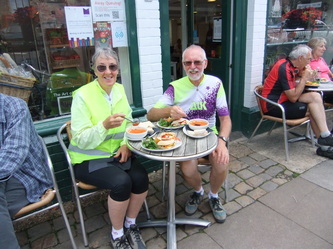 A long coffee stop at Lillie’s cafe by a stream with ducks and a little light window shopping ensued. 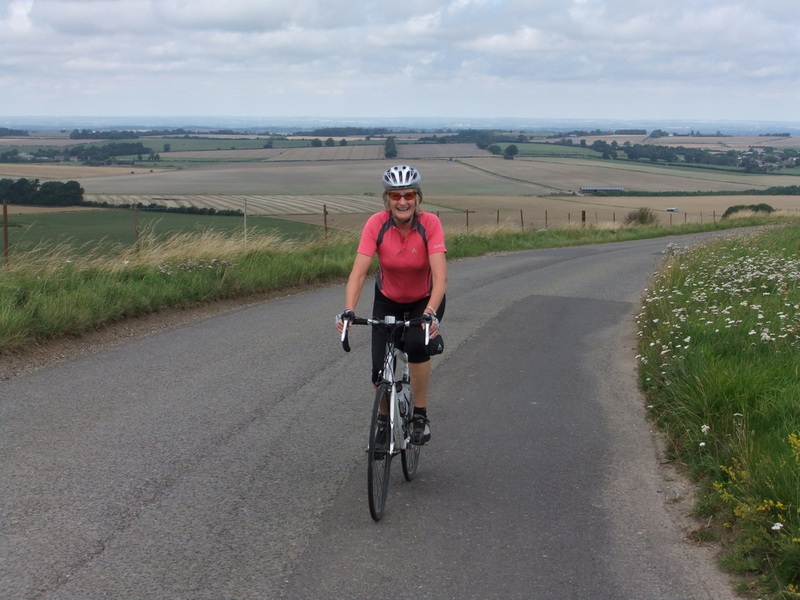 We then followed the Test to Mottisfont where several climbs brought us out of the valley to Kents Oak and a banana breather. 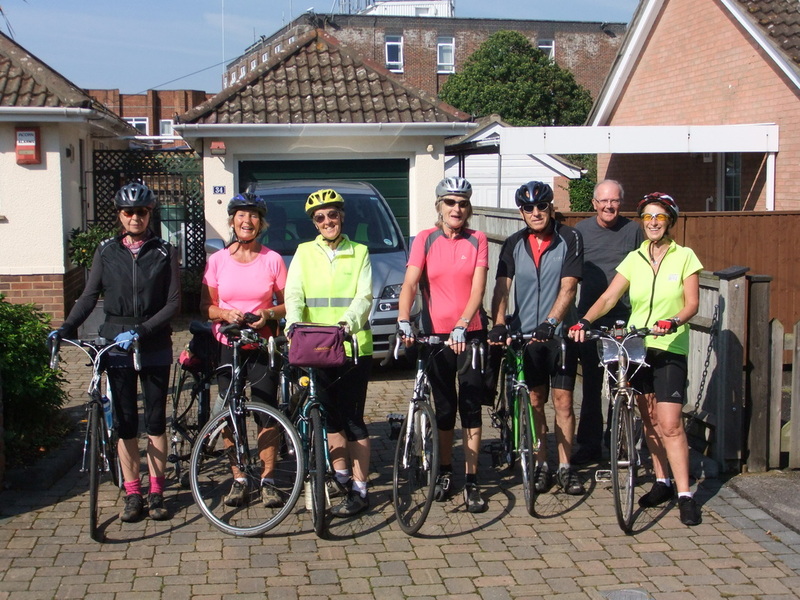 Rolling terrain ensued, and tricky crossings of the A27 and A36 led us back into the New Forest and across the Northern Commons which are managed by the National Trust. 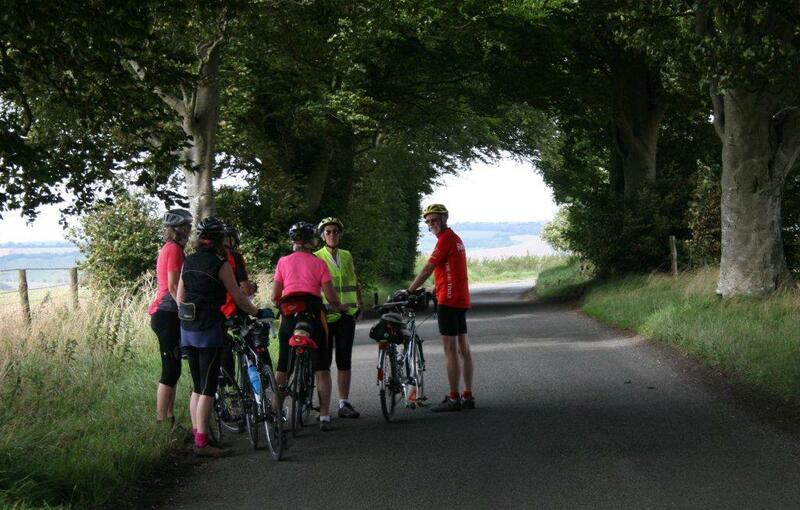 Arriving at Bramshaw the rear of the team enjoyed the sight of a small herd of deer crossing the drive as we ascended to Bramble Hill Hotel for lunch. 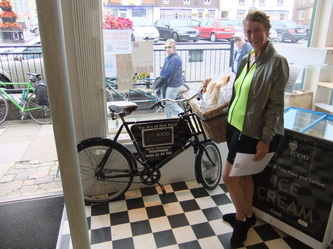 Judy had filmed a Ruth Rendell episode here with ITV 16 years ago and found that the owner recalled the event. 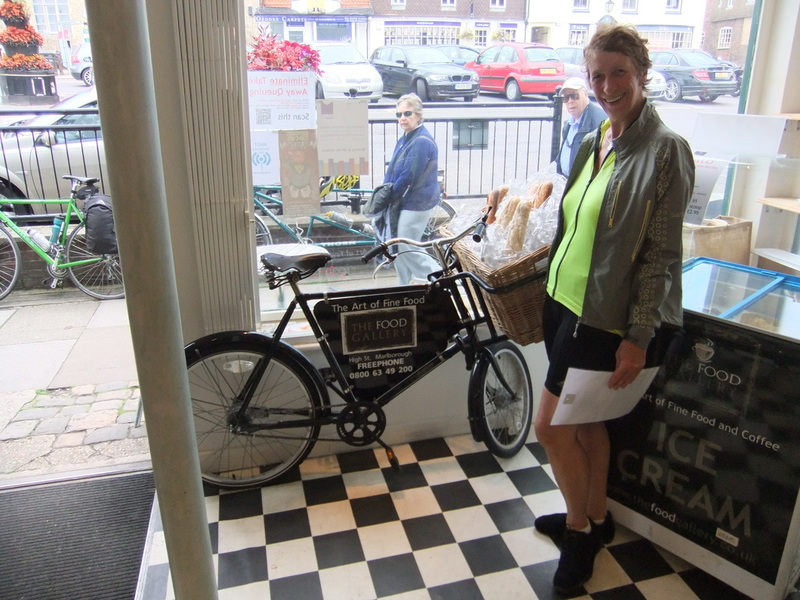 A leisurely (slow service!) lunch followed, sitting in the shade of a tree overlooking the lawns and Forest beyond. 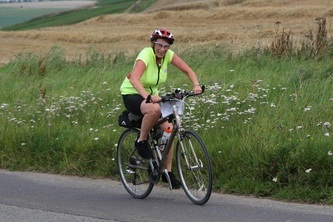 Birgit did her exercises and Judy joined in. The rest of us just sat. ... but we did see her again when she and Mike kindly returned our bags.